And good design is beautiful. I had a birthday recently and I made it extremely clear what gift was to given to me. Now, I know you're thinking I must be very pushy, but really it's not that. Last year we gave my 19 year old a kindle. She loved it so we thought the kindle would make a great Father's Day gift for my adorable and sweet husband. We were right. He loves his kindle. For Hanukkah this past year we gave my fabulous mother-in-law a kindle too. She loves it! We all went on vacation together to Mexico in December and everyone brought their kindle. I borrowed my daughter's kindle to read a book and I loved it. Ever since then, I have been waiting for a special occasion to justify buying a kindle and my birthday was it. I love the fact that I can adjust the font size for my over 40 eyes. I love that when I travel I am just bringing one item instead of several books. I love that I can download many books almost immediately and get the instant gratification and start reading right away. I love that books on kindle are much less expensive than buying hard copies from the book store. I love the fact that I will save so much space by not having to store any new books on my bookcases. Well, except for interior design books that are photo filled. I ordered the most beautiful cover to protect my new kindle. It is hand tooled leather. Here's my blue peacock tooled leather cover with an ornate pewter latch. 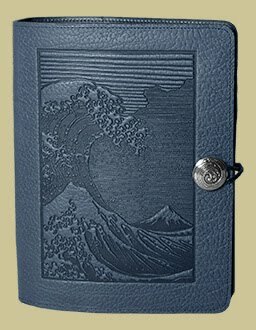 Here's what my cover looks like with the kindle in it. As you can tell, the workmanship on their products is incredible. Oberon Design is the company that I made this beautiful cover. We ordered a cover for my daughter's kindle last year that I truly love as well. Her design is a Tree of Life design. Oberon Design makes all kinds of products that can be made with leather and pewter. Take a look at this incredible handbag. Here's an unusual organizer cover that I would love to own. Here's a few examples of their pewter jewelry. I just want you to know that I am in no way being given any incentive to promote their products. I just know beauty when I see it. Stop by Oberon Design's web site and check them out. You'll be glad you did. You're right -- those items are fabulous. I hope you had a wonderful birthday! I'm lovin' the red an black bag and the jewlery! Now, I'm off to research kindle's... I might just enter this centry one of these days! Thanks for sharing those artful covers! Those are beautiful! Thanks for visiting my blog. I am your newest follower.